Hello Sunshine! I am back with another laundry room update. 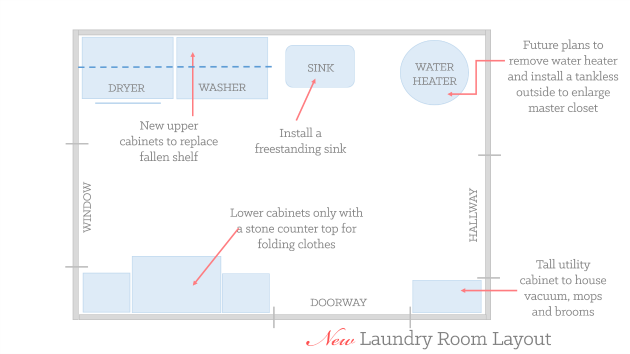 Two weeks ago I announced that we're redesigning our laundry room and shared some inspirational spaces. Today I will give you an idea of how the room will be laid out and our overall plan. Before committing to any design plan I believe it is best to live with the room as is for a while. This simple step will allow you to see how the room is used and the things that should live in it. Our laundry room is not only used for washing and folding clothes but we also use ours for additional storage. 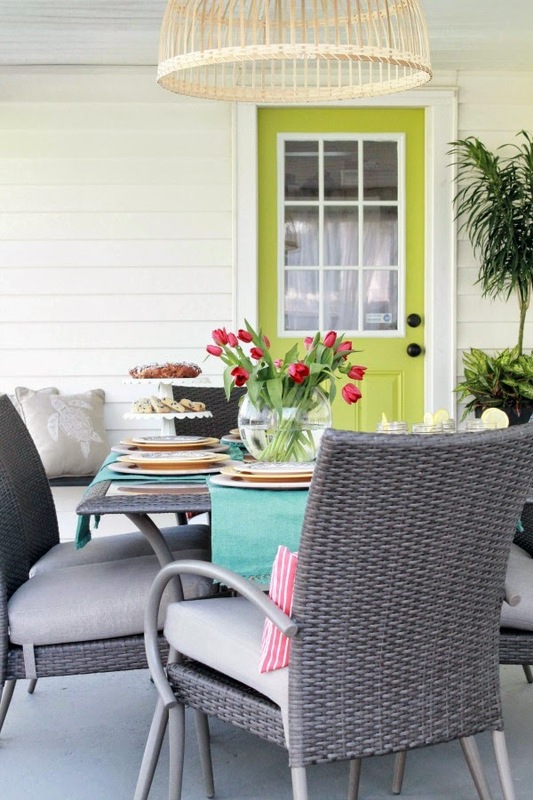 Living in an older home has its fair share of storage dilemmas and we have spent a great deal of time minimizing and streamlining clutter but some things we just can't get rid of and they need a home. That home is our laundry room. 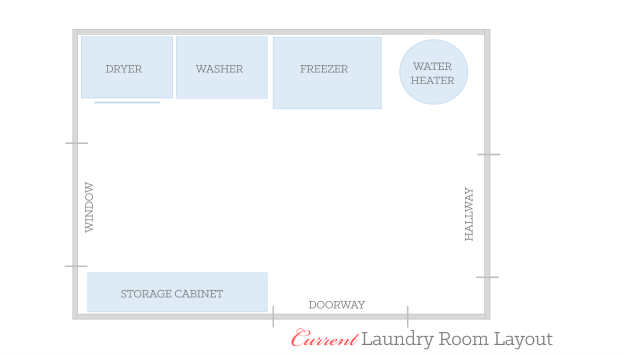 Our current laundry room houses the washer|dryer, freezer, water heater, and large storage cabinet. Besides adding the storage cabinet, drapes, new light fixture and hanging a shelf above the w|d, that has recently fallen and started this whole process, the room pretty much looks the same as the day we moved in. We plan to do this makeover in stages and take our time. I like for our house to develop organically and over time. I am in the process now of picking out the cabinetry, looking at flooring options and paint samples. When I narrow down the look we are going for I will share our mood board. cant wait to see what you do. I agree. developing a room should take time. I know yours will look great. Your diagrams are put together well. Looks like we have work to do huh? So exciting! Love the ideas you have in mind. Can't wait to see it all come together. Its going to be fantastic the space already sounds like it has so much potential to be exactly how you want it!! Such a well thougt out space my friend. I think some of the best spaces are the ones that are created in stages and slowly curated. Cant wait to see it all come to be!